While studying theatre design in 2011, I desperately learned everything I could to one day get my work on the National Theatre’s Olivier stage. I judged any future success by the size of the proscenium-arch my designs would stand beneath. Cut to the youth of today and the goals couldn’t be further away. Just eight years on, when I talk to students and hear the pitches to the National Student Drama Festival, the ideology has totally changed. My conventional end-on dreams make me seem ever so twee. Site-specific work is king, a bar is better than an auditorium, and an abandoned warehouse is more coveted than a studio space. So what’s brought on this wave of rejecting traditional venues? Has our distrust for any establishment buildings spread all the way to theatres? Or, in a time of arts cuts and austerity, are we forging new ground out of economic necessity? Or is it just trendy? Whatever the case, in a industry where we increasingly appreciate the importance of design, this grotty, found-space aesthetic might just be an anarchic, visually striking movement coming to a disused basement near you. And isn’t that exciting? I’ve been lucky enough to do a few shows in unusual spaces. 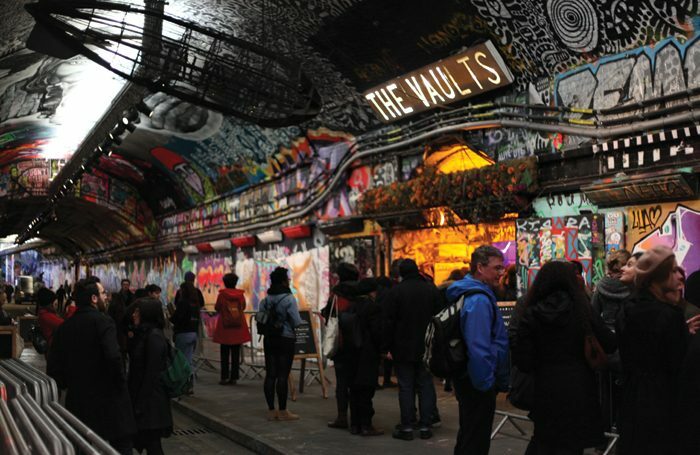 STYX, a former ambulance depot, in Tottenham; Theatre Deli, a former Woolworths, in Sheffield and of course the expansive Vault Festival, which takes place in the railway arches underneath Waterloo Station. These were all productions with seriously technical design, and all plays that took place in the depths of winter (have you ever seen paint freeze before it can dry? ), and all plays that simply wouldn’t have been as interesting in a conventional theatre space. Learning to think laterally, to daisy-chain with extension cords, to give the work framing devices that it can thrive and buzz in. That’s what is so brilliant about the lo-fi shows – they’re allowing/forcing theatremakers to work in a more conceptual way. It is important however to point out that an interesting space should only enhance visual work. An industrial brick wall can’t replace a designer, just allow them to work differently. There’s plenty of time to work out how to do a not-too-wobbly 19th-century drawing room later; for now, give me madness and confetti. I’m looking forward to see how this movement grows and develops. Will the National eventually become totally abandoned, overgrown and dilapidated by the march of time? Only for that to make it the coolest venue in town? I don’t know. My brain can’t deal with a concept that meta. Whether the rise of conceptual lo-fi site-specific theatre is out of distrust or necessity, it’s certainly birthing a lot of invention. Students are fighting against being put in black-box studios, so let’s find them alternative rooms. Unusual spaces are in and as a designer I can’t wait to pop on a warm coat and head down to the nearest converted telephone booth to see some of the most unusual and compelling design work theatre can offer.